Yale University, Duke University, Amherst College, TCU, and the University of Texas at Austin have joined 60 other prestigious universities nationwide in hosting summer tech programs held by iD Tech Camps and iD Teen Academies. iD now has programs held at 7 of the top 10 national universities ranked by the U.S. News & World Report. An essential part of choosing what college or university to attend is the campus visit, which allows students to get a sense of a school’s atmosphere and surroundings. According to an Art & Science Group poll, college visits were the leading influence on students’ application decisions, with 65% of students citing them as the most influential source of information in the process. One increasingly popular strategy for students to experience life and learning on a college campus, before actually attending college, is through summer camps held on campus. Many educational summer programs, such as STEM (Science, Technology, Engineering, and Math) leaders iD Tech Camps and iD Teen Academies, specifically host their summer programs on college campuses to give students a pre-college experience. With the additional locations that these summer computer camps recently announced for their new 2012 season, students have more campuses to explore than ever. Big-name schools joining the list of iD program locations this year include Yale University, with a new New Haven summer camp, as well as Duke University, Amherst College, and the University of Texas at Austin. Counting the new additions, iD now has programs held at 7 of the top 10 national universities ranked by the U.S. News & World Report. Returning iD locations include prestigious universities Stanford, Harvard, Columbia, Northwestern, NYU, UCLA, and more. Popular sites such as Stanford University – which hosts all iD programs, including iD Tech Camps for ages 7-17 and 3 Teen Academies in Gaming, Programming, and Visual Arts – always fill up fast. The programs, located in 27 states, feature courses in STEM subjects ranging from game design to app development, programming, robotics engineering, web design, digital photography, and more. In addition to the new locations, iD has also expanded its repertoire of course subjects, offering new movie camps and camps where students create iPhone apps. Curriculum for all courses is all project-based, so students complete each weeklong or two-week session with a project that demonstrates their new skills. 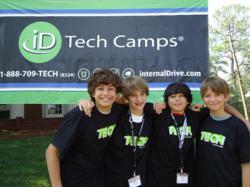 iD Tech Camps is the World’s #1 provider of summer computer camps and technology camps for kids and teens with programs held at 60 elite universities in the U.S. Summer camps are held at Stanford, Princeton, Harvard, UCLA and other prestigious universities nationwide. Over the past thirteen years, more than 120,000 students ages 7-18 have participated in the iD programs. Students create iPhone® apps, 2D and 3D video games, websites with Flash®, C++ and Java programs, 3D models and animations with Autodesk® Maya®, digital photography, films, robots, and more. There are also 2-week Teen Academies: iD Gaming Academy, iD Programming Academy, and iD Visual Arts Academy. Visit http://www.internalDrive.com or call 1-888-709-TECH (8324) for more information.